All instruments and gauges are easy to read and indicate driving information like engine speed, traveling speed, PTO speed and also speed range for operator's proper work. 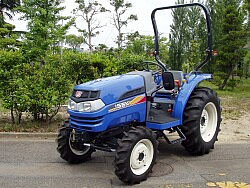 Iseki's TG range offers a comfortable driving platform and seat position provide ample space. 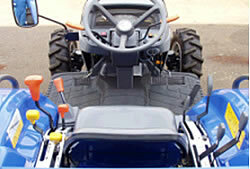 All levers are ergonomically located around the driving seat and make easy access to the cockpit. IQ shift (Q version only) is programmed to several clutch engagement pattern and select the most suitable pattern depending on gear position to make smooth change. 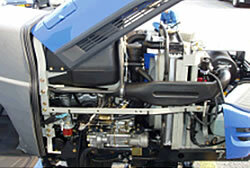 PTO engagement system is 2 mode adjustable PTO engagement and it give you more comfort for PTO operation. PTO engagement is quite smooth for this system. 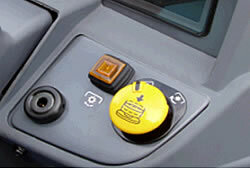 .When PTO is engaged, monitor light is turned on and indicates PTO is rotating. The engine has large displacement and its stable torque at all engine speeds ensures power in reserve whatever the high or continuous load. The engine is not only powerful, but also clean and quiet for environment and meet EU type approval (74/150/EEC, 2001/E) Noise level is 86 db(A) to be implemented in 2001 and Emission level complies European emission regulation Stage 3A.